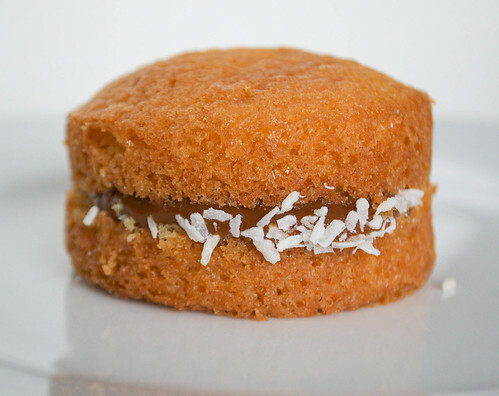 I was quite surprised, when I was in Argentina, how often dulce de leche is paired with coconut. They also pair membrillo and dulce batata with coconut, in tarts and cakes. But it was the dulce de leche combination I was most keen to try when I got home. And here it is. A moist vanilla sponge, split in half and spread with thick, glossy dulce de leche and then rolled in desiccated coconut. I used a mini sandwich pan from Lakeland for this, and you'll need to get hold of real, proper Argentinian dulce de leche. Some supermarkets stock tins of caramel labelled 'dulce de leche' but it's quite often paler, runnier and just doesn't taste - or behave - the same. Go on, you would, wouldn't you? Heat the oven up to 200ºC and very lightly butter the holes of a non-stick mini sandwich tin. In a bowl, cream together the butter and sugar until pale and fluffy and crack in the eggs. Beat, until you have a fairly smooth mixture, and then stir in the vanilla extract. Next, fold in the flour and baking powder. Trickle in about a tablespoon of milk if you feel the mixture is too stiff, and divide it between the indents of the mini sandwich tin. Gently slide into the oven and bake for 15-20 minutes, until the tops are just golden and have risen. Take out and leave to cool completely - leave for 5 minutes in the tin and then gently transfer to a wire rack to finish cooling completely. Once the cakes are completely cool, cut them in half with a serrated knife and spread with the dulce de leche. Measure out the coconut into a bowl and roll the sides of the cakes into it, so the coconut sticks to the caramel. Dust with icing sugar if you like, to serve.